Spring has Srung – Whats up with all this Snow? I am sitting here in the campus library contemplating my conclusion for a major paper. As always, it is hard to clear my head of the jumbles that are called thoughts. The body of work is done, I’ve added the tables and references, but that stupid conclusion!! It needs to pull the paper together in such a way that says…ET, you are brilliant! All I want it to say is THE END! So here I am thinking about my week instead. My week is a key component to my paper. It is about Team Function. So I need to think about the roles my team plays as individuals and as a collective. But all I want to really think about is Spring Break! Spring Break Past and Present. Officially Spring Break starts tomorrow. In years past I have been walking down Main Street USA, heading towards the castle and on to Space Mountain where I laugh at the screams from my family. When I was young it was my brother who screamed, now it is my ChatterBox. The thought of walking around in a t-shirt makes me yearn for the 5 feet of snow in my yard to disappear. 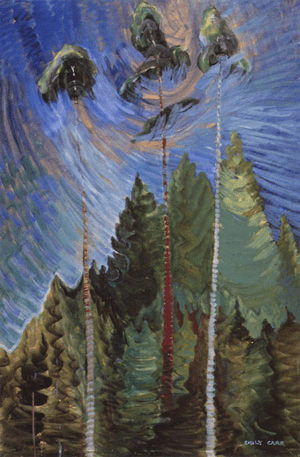 To kick off Spring Break, I visited Emily Carr at the Alberta Art Gallery. Her last years of painting really spoke to me. The walls were filled with her quotes that were poignant and meaningful. I downloaded some of her books to read this week. Her talent amazed me. So on I moved to dinner with my Honey. So delicious and kid free. It was a lovely evening. Then we strolled back through the snow – (are you kidding me? Spring break and too much snow still!) to our car. We talked about my plans for the week. Work outs and Yoga mixed with writing my final paper for school. Most importantly…sleep. I miss it and crave it. Spring Break comes for the right time for me. If I can’t go away for a mental break, then I shall have it here. I can’t wait to get started! I am going to dream of summer and hot sun, green grass and Friday night picnics. Oh the sweet feeling of relaxation. I needed this. So in conclusion…THE END! Hmm I think my conclusion still needs work. Will dreaming about summer, hot sun, & green grass make it so? I am so tired of winter. And yes I’ve lived here all my life. Next week it’s April! At least by this time of year we can usually see brown grass. Just cold, wind, and snow. If I dream real hard, can I make it spring? Sure? Word of caution, it doesn’t seem to be working for me. ROLL ON SUMMER! You know, at this rate all that snow of yours might melt just in time for the next snowy season to begin! Way to make me feel better Mark! C’mon…you must be used to it up there!! Sometimes there doesn’t have to be an exiting happy all inclusive ending. Sometimes things can just end. Perhaps leaving questions for a follow up.